Okay everyone, you know Valentines Day is right around the corner. It’s that time to show that special someone in your life just how much they mean to you. You buy them flowers, candy, and jewelry if that special someone is of the female persuasion, and if it is a guy, well what exactly does one get a guy? Generally it is just more of what you got them the year before… NOTHING! At the risk of getting a lot of back lash for this.. Valentines is more of a female holiday however, I would like to see it become a Jeep Lovers holiday! See, that way it is a gender-neutral holiday! There are already many off roading Jeep fanatics that are women, and the numbers are climbing and well we already know where the numbers strand with the men… so instead of the frilly flowers, candy, and jewelry, I say we show our love to our jeeps! I even have a few suggestions to get you started! Okay, for those of you who feel you might have to hit the couch for a week or two if you buy a gift for your Jeep instead of your woman, get a rose or two and make a nice floral arrangement out of a new winch and maybe a few green leaves to spice it up. Make a candle light dinner (better yet, order it – less fuss) and use your winch floral arrangement as the table’s centerpiece! Everyone is happy then! Who’s with me on this one? 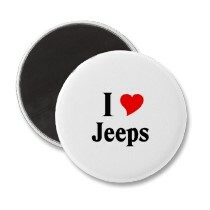 Come on everyone, even the Jeep needs a little loving on Valentines Day! Here are some great specials to get you started! The new Smittybilt Comp-Series XRC 8 Winch encompasses all the best features you would want in a winch. Every XRC 8 (8,000 LB.) winch features a 5.5 HP Series Wound Motor and a Planetary Gear System with 172.8:1 gear ratio that will deliver power and reliability at a premium price. For a recovery system with the muscle and dependability to bail you out of any situation, the XRC 8 has all the heavy-duty toughness you’re looking for. Rugged Ridge Black Rear Receiver Hitch For 2007-09 Jeep Wrangler JK And Unlimited 4 Door Custom design bolts directly to factory mounting points on the rear of the vehicle, very similar design to the OE Receiver Hitch. Durable powder coat design sheds water and provides a long lasting rust free finish. Includes cutout for factory wiring harness mounting. Designed as a one-piece welded assembly for added strength, we built our hitch receiver to match the towing capacity of your Jeep: 3,500-lb tow rating, 350-lb tongue weight rating with weight distributing equipment; otherwise 2000-lb tow rating, 200-lb tongue weight rating, 2″ opening. Built from heavy duty 3/16″ steel plating and powder coat painted for the utmost longevity, the Smittybilt SRC Classic Front Bumper upholds the standard of performance that Smittybilt has long been known for. For those that are looking for the absolute best performance off-road, Rough Country offers its 4 suspension system. Designed with Rough Country’s new Performance 2.2 series shocks, this kit provides near factory on-road ride quality and the required performance off-road. The 4 suspension also includes unique front and rear coils for 2-door and 4-door models. An adjustable front trac bar, front sway-bar links, a rear trac bar drop bracket, brake line brackets, and cam bolts to maintain factory steering geometry finish out this complete lift system. Each of these new suspensions also includes Rough Country’s limited lifetime warranty. Sounds a little off the wall, but my girl is always telling me I have no imagination. She might just get a kick out of it. I’m going to try it and I’ll let you know the reaction I got. Then again, she may be so surprised that supper is on the table that she might overlook the centerpiece. Who knows? You obviously don’t know my girl. If I tried something like that she’d throw a fit. She’s OK with me buying things for the Jeep because she loves it as much as I do. But, to buy something for the Jeep and not her? No way pal. I’d be looking for a new girlfriend and I kinda like the one I have. I believe you! I bought my hubby a winch for Christmas and he’s still telling everyone about it. Since then he has filled out a wish list, complete with a full description and approximate prices. I know what I’ll be giving him for Valentines Day this year. I think I’d better keep my love for my Jeep until after Valentines Day. I already spend more on it than I do on my wife. I might be in some deep doo doo if I start buying my Jeep a Valentines Day gift. Take my word for it! A winch floral arrangement sounds way cool. I’m going to give it a try and see how it turns out. I’m thinking if I make sure the meal is on the table she won’t care what’s being used as the center piece. She has a solid sense of humor and I think she may just crack up laughing.